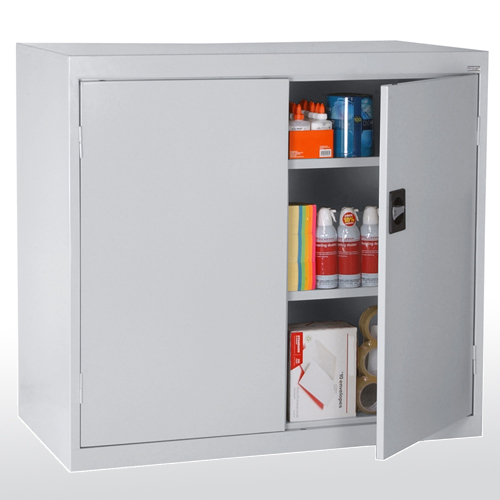 Heavy gauge steel, contract quality, meets ANSI/BIFMA shelf standards. One fully adjustable shelf plus raised bottom shelf. EA11 361830-00 has three point locking handle. EA11 182430-00 has cam locking handle. Powder coat finish. Heavy gauge steel, contract quality, meets ANSI/BIFMA shelf standards. Two fully adjustable shelves plus raised bottom shelf. Contemporary three point recessed locking handle. Five year limited warranty. Powder coat finish. Shipped assembled. Heavy gauge steel, contract quality, meets ANSI/BIFMA shelf standards. Three fully adjustable shelves on 2” centers, plus raised bottom shelf, cam lock attaches to the side, and three sets of hinges on each door. Five year limited warranty. Powder coat finish. Shipped assembled. Heavy gauge steel, contract quality, meets ANSI/BIFMA shelf standards. 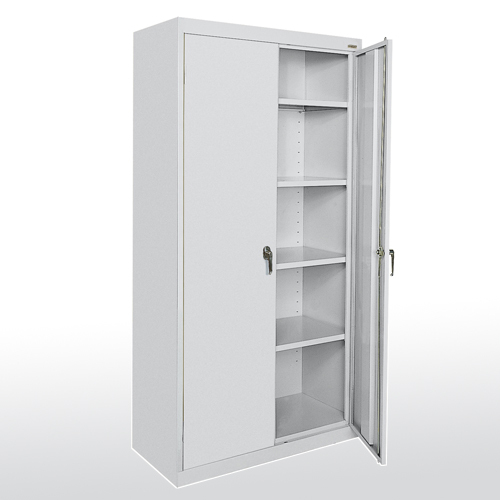 Four fully adjustable shelves on 2” centers, plus raised bottom shelf, contemporary three point recessed locking handle, three sets of hinges on each door. Five year limited warranty. Powder coat finish. Shipped assembled. Heavy gauge steel, contract quality, meets ANSI/BIFMA shelf standards. Four fully adjustable shelves on 2” centers, plus raised bottom shelf, three point locking swing handle and one dummy handle, three sets of hinges on each door. Five year limited warranty. Powder coat finish. Shipped assembled. 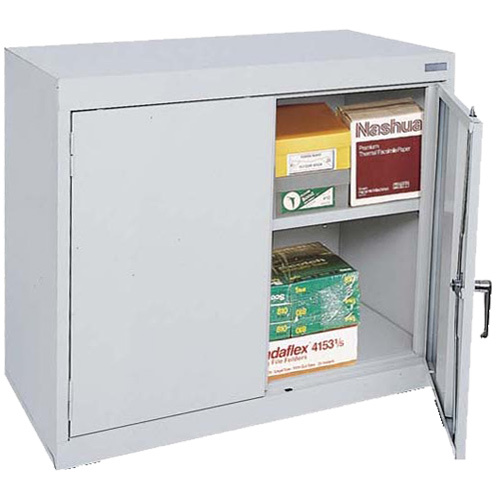 Heavy gauge welded steel construction, meets ANSI/BIFMA shelf standards. Four adjustable shelves on 2” centers, plus raised bottom shelf. Three sets of hinges on each door. 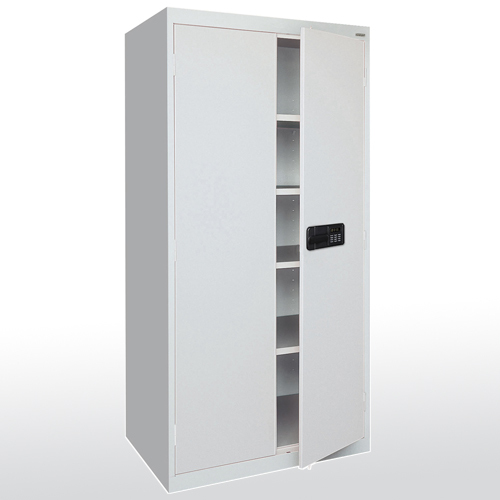 The cabinets are equipped with a keyless electronic coded locking system. The coded lock is available with two passwords, the administrator and the user. These can be changed to any combination of numbers, four for the user and six for the administrative password. The keypad also keeps a record of the day, date and time of when the cabinet is accessed, which can be displayed when the mechanism is idle. Emergency key included. Powder coat paint finish. 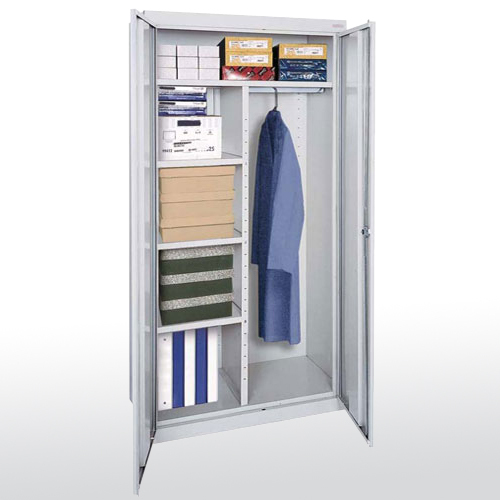 Combination cabinet interior includes a full width top shelf, three adjustable side shelves, and a garment rod. Contemporary three point recessed locking handle. Powder coat finish. Interior requires assembly. 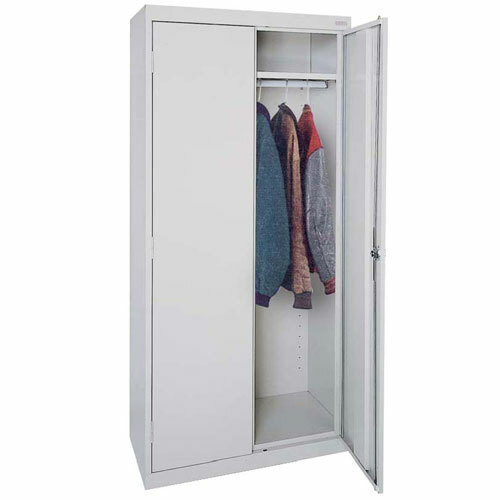 Wardrobe cabinet interior includes a full shelf and garment hanging bar. Contemporary three point recessed locking handle. Powder coat finish. 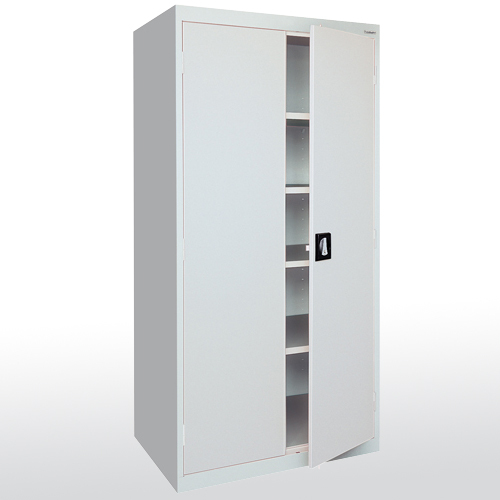 These cabinets have two other handle options to choose from; swing locking handle and electronic locking handle. 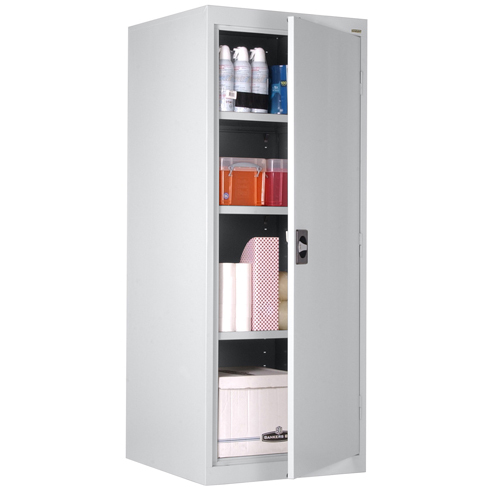 To compare several categories within Cabinets, click on View All Cabinets.